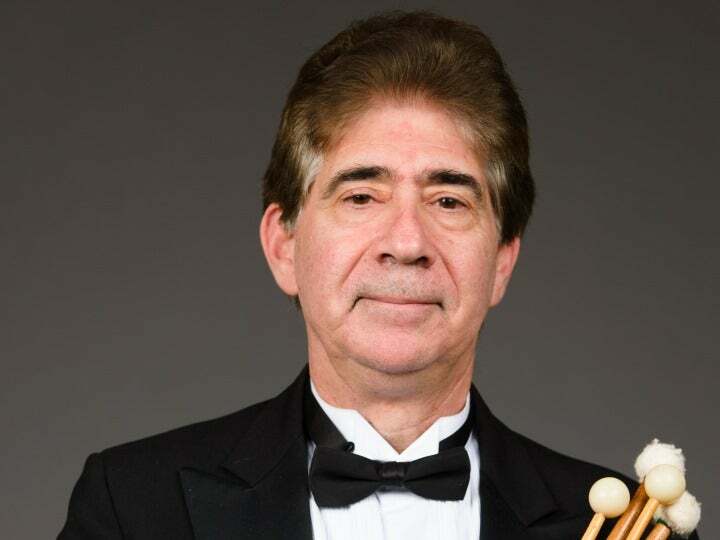 DAVID FEIN has been Principal Percussionist of the New Jersey Symphony Orchestra since 1979 and an adjunct percussion faculty member of New Jersey City University since 2009. In 1978, Fein became the first percussionist to receive the Doctor of Musical Arts degree from The Juilliard School; his first Juilliard instructor was Morris Goldenberg. He served as a percussion instructor at The Juilliard School’s Pre-College Division for 31 years; he was appointed to the position at age 19 in 1973 by mentors Saul Goodman and Elden C. Bailey. Many of his former Juilliard Pre-College students perform with symphony orchestras both as percussionists and conductors. As a conductor, Fein has led performances with the NJSO, New Haven Symphony Orchestra, Merrick Symphony, Juilliard Percussion Ensemble, Juilliard Dance Ensemble, Contemporary Dance System, Doctors Orchestral Society, New York Youth Symphony, New Jersey Ballet, Hartford Ballet and Northeastern Pennsylvania Youth Orchestra. He received conducting training at the National Orchestral Association with Leon Barzin and at Juilliard with John Nelson. I have been the principal percussionist since 1979, but I started playing with the NJSO when I was still a student at Juilliard. I was actually the first percussionist to earn a doctoral degree from Juilliard, and I started teaching in the school’s pre-college division when I was 19. What inspired you to start playing percussion? Piano was actually my first instrument. I’m a Washington Heights [New York] native, and my public school system was very rich in music. When I got to junior high, I planned to play a wind instrument, but there were too many students, so I wasn’t going to have the chance. My music teacher let me into the band playing percussion, which is what I really wanted to play … I had already taught myself how to do a drum roll. The Beatles really made me want to be a musician; their harmonies and melodies inspired me. Incidentally, I still see that junior-high music teacher—he subscribes to the NJSO. What are some memorable parts of your NJSO tenure? I had the opportunity to play Bolero as a soloist and stand on the front of the stage. It was an incredible experience to get to build that kind of rapport with the NJSO audience. Being the principal percussionist for the NJSO is really fantastic. I freelance as a musician in the New York area, and I am the Vice President and Regional Director of Operations for the Total Traffic Network in New York. I’m really into transportation, like trains and automobiles. I study old track maps, and I’m an expert in New York City public transportation. I love the Mets, so I hope that this offseason, the Mets management can get themselves together and make some quiet improvements. So you’re a Mets fan. If you could have dinner with any three players in team history, who would they be? Willie Mays—he is one of the best baseball players ever, and he was a Met for a time. I was actually in the same building as Tom Seaver once, but I missed him by a minute. I’d like to meet Jose Reyes too.